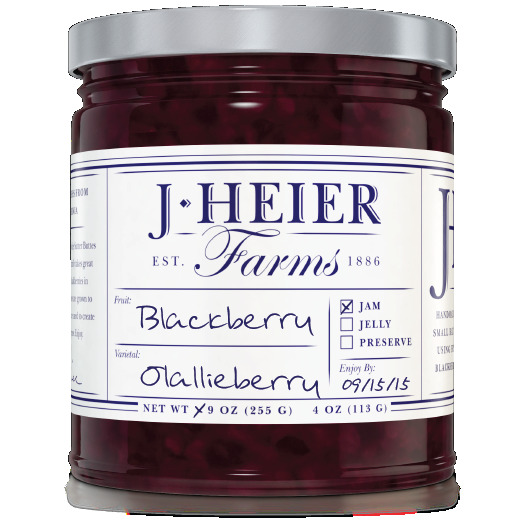 The Olallieberry is a cross between the Loganberry and Youngberry. “Olallie” is a word for berry used by Native Americans of the Pacific Northwest. This berry is known for its tart, sweet, and juicy qualities. The Olallieberry is our sweetest variety, and tastes delicious eaten straight off the vine. This is Marie Heier’s favorite variety! OlallieberrIES, pure cane sugar, and pure lemon juice.